In what may change the land scape of many city schools, the Chandigarh Administration has issued notices to 10 schools saying they have surplus land which is not being put to optimum use. Justifying donations by schools on the pretext of providing quality education and infrastructure for the overall development of pupils, the Chairman of the Indian Public Schools Committee, Mr B.R. Dubey, today demanded the introduction of the grade system to evaluate the performance of students. Is MCC a paper tiger? Is the Municipal Corporation of Chandigarh, an authority only on the papers? So, it appears if one looked at the fact that a large number of schemes passed by the corporation on paper were non existent on the grounds of the city. Believe it or not — even in the post-Sam Pitroda India, there is still a place in the sun that does not have a Bharat Sanchar Nigam Limited telephone. Much to the advantage of its private competitors and much to the inconvenience of the residents, BSNL has not been able to extend its cable network to Sector 68 here. One person was killed and three others were injured when their Tata Sumo collided with a CTU bus near Nilokheri in Haryana. Sumitra Devi of Barwala succumbed to her injuries in the PGI here. Tata Sumo was one of the five vehicles that collided in the multiple accident, the police said. Criminals sometimes go scotfree for want of evidence, leaving forensic scientists dismayed as the data related to crime is stored in the impregnable brain of a perpetrator of crime. Before the interaction session of students attending the Children’s Science Congress with the President, Dr APJ Abdul Kalam, got underway, the organisers gave strict instructions to children about sticking to their seats. “Don’t try to come forward to get autographs from the President or shake hands with him. Leave your seat only if he asks you to,” they were told. Yet another sambhar strayed into the territory of Chandigarh this morning. 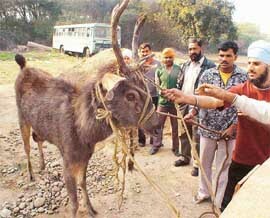 Severely bruised in the left leg, the sambhar, spotted in the area near Gursagar Gurdwara behind the Lake Club this morning, was caught by about six youths after an hour-long struggle. Hundreds of miles away from her native place in Nagaland, 21 year-old college student Piholi Jakhalu makes no secret in confessing to have found a second home at Goel’s place in Sector 8, Panchkula, where there is a perfect grandpa, a granny and a sister. Suman Preet Singh, Indresh Goyal and Taminder Jot Singh Behal were today declared “road rules toppers of 2003” in Chandigarh Carnival. 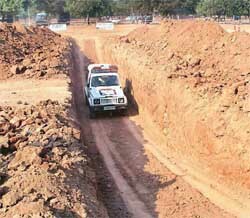 Constable Mohan Lal of the Chandigarh Police was adjudged the best driver in a competition from amongst 80 participants. The Confederation of Indian Industries, Northern Region, has called a meeting tomorrow to work out strategies for the promotion of contract farming. Experts on agriculture finance and contract farming in the region will meet to chalk out a plan on contract farming. Hundreds of the local subscribers remained cut off from the outside world as telephones went out of order this evening. In a major fire, a booth housing cigarettes and tobacco products, was reduced to ashes in Sector 11 here today. A 16-year-old girl of Khuda Alisher has allegedly been abducted by Harmit Singh of Fatehgarh Sahib. The girl has been missing since 4 pm on January 7. During its anti-liquor smuggling drive, the police failed to nab a car occupant who was driving the vehicles with 2,750 pouches of country liquor on the Chandigarh-Ambala highway last night. The police here has registered a case against Jasmeet Kaur and Ashok Kumar, both residents of Mohali on the charge of theft. According to the police, the two have been missing from their residence in phase 3A for the past three months, but the case was registered against them yesterday. A variety programme and presentation of awards to over 100 students in the academics, sports and co-curricular were the highlights of the annual prize distribution function of MRA Modern Public School in Sector 7 here today. Missing their target of 180 teaching days prescribed by the University Grants Commission, the Panjab University and affiliated colleges, despite an academic calendar to guide them through the session, are way short of the mark this year. Capt Kanwaljit Singh, former Punjab Finance and Planning Minister, inaugurated the new campus of Dikshant International School on the Zirakpur-Kalka highway here today. 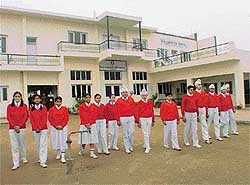 A unit of Scindia School, Gwalior-Alumni, the campus is spread over an area of one acre. 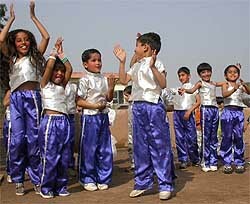 A colourful cultural programme by schoolchildren was the highlight of today’s function. International Public School, Kurali, was established in 1996. Though a fairly new institution, its management includes a team of professionals which focuses on the overall development of students. A view of International Public School, Kurali. As the Principal of the school, Ms Promila Sanger, believes that traditional method of education should be combined with modern tools of teaching. 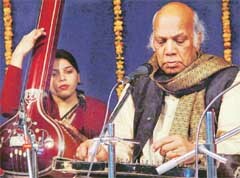 Pandit Mani Prasad, one of the doyens of the Kirana gharana, is known for respecting the purity of raga. Trained in the classical school by his father Pandit Sukhdev Prasad, the veteran vocalist from Delhi, exhibited the nuances of his tradition on the stage of the Pracheen Kala Kendra this evening. Yin and Yang seem to have acquired a cult status in the City Beautiful. Going by the ever-increasing takers for the oriental holistic science of feng shui, the residents are using the elements and articles of this science to create a perfect harmony in their lives. Chandigarh is a place where one could find every kind of facility. Be it sports, education or health. The day I joined skating , was one of the happiest day of my life. I have not missed it for a single day except on Sunday's, the off day for skating. I enjoy taking part in various tournaments and in roller hockey. IT was fun and frolic at Bal Bhawan auditorium, where over 100 Malayalee families had gathered this evening for celebrating New Year. From showcasing their traditional skills to dancing to the latest Punjabi pop songs and playing tambola, the persons who had gathered here had a gala time. 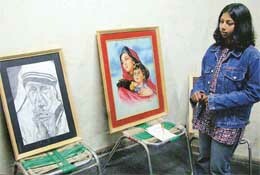 Ashwati displays her paintings during the New Year celebration organised by the Malyalee Association at Bal Bhavan in Sector 23, Chandigarh, on Sunday. BE it antique stone work, zardozi, kantha or hand block prints. The three- day exhibition of designer wear for women at Hotel Aroma showcased the latest in traditional women fashion wear. This was one of the many exhibitions that were tempted the city residents over the weekend. The Society for Promotion of Youth and Masses, New Delhi, will organise a three-day convergence course for representatives of NGO’s from Punjab and other government functionaries in the city from tomorrow. Mandeep Yadav of Chandigarh was the star player today when he rallied to win his second title in the under-14 section at the conclusion of the Total Tennis Championship played here at the YMCA Sector 11. The winners of various events in the Total Tennis Championship which concluded at the YMCA, Sector 11, Chandigarh, on Sunday. 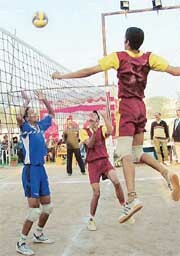 Shivalik Public School, Sector 41, and Coaching Centre, Sector 18, bagged the boys’ and girls’ titles in the Chandigarh Junior State Volleyball Championship, which concluded here today at Shivalik Public School. In the boys’ final, SPS-41 spikers downed Coaching Centre, Sector 46, 25-16, 25-23, 25-23. In the girls’ section, CC-18 outplayed Government Girls Senior Secondary School, Sector 8, 25-12, 25-18, 25-16. The teams qualified on the basis of attaining top slots in the league stage. Boys under-12 years of age gathered at the Forest Hill Golf and Country Club today for the Clash of the Little Titans. The tournament had a good turnout and participants as young as six years (Hemanshu) were seen giving a tough times to senior players. 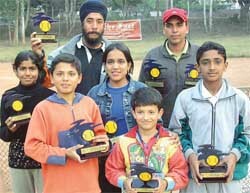 A similar tournament was held in the under-14 category earlier. The Excise and Taxation wing of the Chandigarh Administration has found that two city cloth merchants and one readymade garments seller have been evading sales tax by not declaring their sales to the fullest. In raids carried out over two days it has been found that the three collectively had unaccounted goods worth Rs 46 lakh.